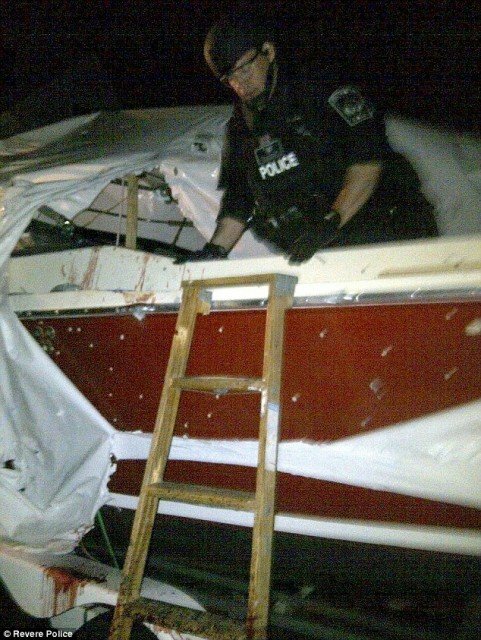 A newly released photo of David Henneberry’s boat, where Boston bombing suspect Dzhokhar Tsarnaev was discovered, shows a bloodied, bullet-ridden port side. The damage has undoubtedly devastated 66-year-old David Henneberry, whose adoration for the rare 21-foot Seahawk boat is widely known among family and friends. Dzhokhar Tsarnaev, 19, who was pulled from the boat after a two-hour standoff with police, was shot in his head, neck, legs and hand, according to federal authorities. He’s now in serious condition in Beth Israel Deaconess Medical Center in Boston, where on Monday he was charged in the twin Boston Marathon bombings that killed three people and injured more than 180. David Henneberry, meanwhile, has been deemed a hero by local and national authorities after he inadvertently discovered Dzhokhar Tsarnaev Friday evening. During the standoff, David Henneberry and his wife fled to the home of his neighbor, George Pizzuto, while officers fired on his beloved boat and helicopters swarmed overhead, using infrared lights to peer through the tarp and locate the suspect’s body. Several hours later, following a brief exchange of fire and some negotiating, Dzhokhar Tsarnaev was taken into custody. It is unknown whether Dzhokhar Tsarnaev sustained all of his injuries during Friday night’s standoff or during the running gun battle with police early that morning. His brother and suspected accomplice in the bombings, Tamerlan Tsarnaev, 26, was killed in the Friday morning gun battle. Dzhokhar Tsarnaev’s neck wound is reportedly self-inflicted. He is believed to have put his pistol in his mouth and fired, but he survived because the bullet passed through his throat instead of his brain. Dzhokhar Tsarnaev was charged on Monday with one count of using and conspiring to use a weapon of mass destruction – namely, an improvised explosive device or IED – against persons and property within the US resulting in death, and one count of malicious destruction of property by means of an explosive device resulting in death, according to a criminal complaint. If he is convicted, Dzhokhar Tsarnaev could face a penalty of death or imprisonment for life. Since the standoff that centered around his beloved boat, David Henneberry has tried to stay out of the media spotlight. But David Henneberry’s stepson, Robert Duffy, has gladly shared the story of his stepfather’s courage and quick thinking with a number of television networks and newspapers. His neighbor, George Pizutto, said David Henneberry would be “heartbroken” by the damage to his boat. “That boat’s his baby. He takes care of it like you wouldn’t believe. And they told him it’s all shot up,” George Pizzuto told ABC affiliate WHAM-13. George Pizzuto later told reporters that David Henneberry feels overwhelmed by all the attention and that he isn’t ready to talk about what happened or his role in finding the suspect. A fund set up online to help David Henneberry buy a new boat has raised $256 with a goal of raising $50,000.